The first series of opening events of a twleve day tour Jack Kerouac Wrote Here; Crisscrossing America Chasing Cool created by Dr. Audrey Sprenger, for 35 students from SUNY Potsdam, as an acredited college mid-term course. The opening two days features concerts, urban hikes and seminars in San Francisco, celebrating the fiftieth anniversary of Kerouac and Amram's first jazz/poetry readings ever presented in New York City in 1957 with Bay area poets Howard Hart and Philip Lamantia and classics of jazz and World music with Amram's trio and guest readers Herb Gold and others. A tribute to Hunter S. Thompson with readings by his son Juan Thompson, grandson Will Thompson and widow Anita Thompson, accompanied by Amram's music. Following the train ride from Denver to New York, the artistic community of the past half ceentury is celebrated with urban hikes, a visit to artist Ed Adler's studio, performances at Theater of the New City with actor John Venetimiglia, journalist Pat Fenton and Amram's trio performing readings of Kerouac and classics of jazz and world music, a program at the Bowery Poetry Club featuring today's young innovators and SUNY Potsdam students performing their own creations in Brooklyn. Tours, seminars, a concert with resdings honoring Lowell Celebrates Kerouac Festival with Lowell artists poets and scholars Larry Carradini, Meg Smith, Paul Marion, Roger Brunelle, Billy Koumentzalis, John Leite and Phil Chaput. Final program features sociologist Charles Lemert and performances of Amram's chamber music compositons including a movement of his flute concerto Giants of the Night composed for Sir James Galway, which includes two French Canadian folksongs sung to Amram by Kerouac which the author learned in Lowell as a boy. to be published by Paradigm Press August of '07, and finishing composing Symphonic Variations on a song by Woody Guthrie to be premiered September 28 '07. The Brooklyn Conservatory celebrates Black History Month, with a program of compositions by Thelonious Monk and Amram. Soloists include Earl McIntire, Cecil Bridgewater, Rene Manning and Amram. be presented prior to the concert. Feb 9 • 12-2 pm • Concert with David Amram Trio in Hollywood California for Walk of Fame. Reading from his book Offbeat: Collaborating with Kerouac speaking to English Literature students about creative writing and combining words and music, as he and Kerouac pioneered in NYC in the Fifties, with the forst jazz/poetry readings ever given in New York. March 1-10 • full time 2 weeks • Completing final chapter and revisions of third book Upbeat; Nine Lives of a Musical Cat to be published by Paradigm Press August of '07, and finishing composing Symphonic Variations on a song by Woody Guthrie to be premiered September 28 '07. Actor John Ventimiglia of The Sopranos and other guesta. Performances of Amram's orchestral and chamber music, and seminars in composition, music theory, world music and classes of French and Middle-Eatern studies, showing the relationship of middle-eastern music's influence on literary artists, visual artists and performers in the fieldsof dance, music and the theater. March 15-17 • 8-11 pm • Los Angeles Release Celebration of Photographer Chris Felver's New Book "BEAT"
Flutist Claire Scandrett performs the Mexican Premiere of Amram's Concerto for flute and orchestra Giants of the Night March 16, 2007 with the Xalapa Symphony Orchestra in the state of Veracruz. The concerto was commissioned and recieved its world premiere by Sir James Galway, with whom Claire Scandrett studied. March 19-april 11 • - • Completing final chapter and revisions of third book Upbeat; Nine Lives of a Musical Cat to be published by Paradigm Publishing August of '07, and finishing composing Symphonic Variations on a song by Woody Guthrie to be premiered September 28 '07 in San Jose California. The World Folk Music Association will honor folk legend Odetta with a Special Lifetime Tribute & Concert at the 22nd Annual WFMA Benefit concert, Saturday, March 24, 2007. The 7 PM event will held at the Rachel M. Schlesinger Concert Hall and Arts Center, Alexandria, Virginia. Amram will be accompanied by his son Adam, and will join with Jsnis Ian, Caroline Hester, Josh White Jr, Jesse Winchester and Oscar Brand, with filmed tributes by Bob Dylan, Pete Seeger and others. Bowery Poetry Club NYC 7-9 p.m.
Amram joins Professor Irwin Corey and others in a tribute to the great comedian and philospher Lord Buckley. Amram performed with Buckley the night before he died in 1960, and wrote a saxophone concerto Ode to Lord Buckley to honor him. 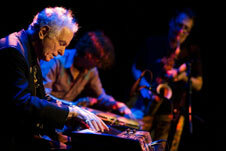 Amram will be joined by his quartet with Kevin Twigg,John de Witt and Adam Amram. Amram returns for the third consecutive year to Portsmouth New Hampshire for the annual festival with guest poet-bassist-singer Eric Mingus,Andrei Cadrescu, and other musicians, poets and scholars, honoring the legacy of composer/band leader Sun Ra, who was a colleague of Amram's in New York City, in the 50s and 60s. of authors and poets with whom he has collaborated, as well as performing his own music. Amram and his daughter Adira return to final event with and for the 32 students from SUNY Potsdam with whom they toured the country in January for the course Jack Kerouac Wrote Here; Crisscrossing America Chasing Cool Perormances and seminars. Amram is guest composer and speaker at a concert held in Bridgeport Connecticut. conducted by Richard Serbagi with his chamber orchestra in a performance of Amram's Shakespearean Concerto for oboe, two horns and stringswith viola solist Midhat Serbagi. Actor John Ventimiglia of The Sopranos and other guests. to be released by Paradigm Publishing August of '07, and finishing composing Symphonic Variations on a Dong by Woody Guthrie to be premiered September 28 '07 in San Jose California. Amram performs for the eighth consecutive year at New York's annual celebration of New York's historic Lower East Side Community. The Kerouac Writer's Residence of Orlando Florida will have its Board of Directors in attendance for a special evening in New York by Amram's quartet with Kevin Twigg, John de Witt and Adam Amram. The free concert at Theater of the New City will include actor John Ventimiglia of The Sopranos narrating the works of Kerouac with music. The quartet will also accompany guest vocalist Trish O'Brien, narrator Jeff Cole as well as performing clasics of jazz, world music and Amram's own compositions. Amram has been invited to speak and perform at the opening ceremonies of Lowell's three month celebration of author Jack Kerouac to be held June 15th. June 18-28 • - • Finishing composing Symphonic Variations on a song by Woody Guthrie to be premiered September 28 '07 in San Jose California. June 30-July 1 • - • FESTIVAL HONORING THE 50TH ANNIVERSARY OF THE PUBLICATION OF JACK KEROUAC'S NOVEL "ON THE ROAD"
Amram is the opening reader June 30th in a marathon reading of Jack Kerouac's On the Road He will also accompany other readers and appear on panels throughout the day. In the evening, he will host a screening of the classic beat documetary silent film Pull My Daisy, narrated by Kerouac for which Amram composed the score, co-wrote the title song with lyrics by Kerouac, Allen Ginsberg and Neal Cassady and in which Amram appeared as Mezz McGillicuddy, the deranged french hornist. Sunday night July 1st, Amram will give concert with Denver musicians Tony Black and Artie Moore, performing classics of jazz, world music and recreating his jazz/poetry collaborations with Kerouac. Amram returns to Aspen to lead a musical tribute to the American author and journalist Hunter S. Thompson, to be held in nearby Woody Creek. In the Summer of 2005, Amram performed at Thompson's memorial service and final blastoff in a band he created which included Johnny Depp, Lyle Lovett and others. The July 4th concert will include brief readings of Thompson's words with music, and some of his favorite global music. The concert will be open to the public. Details TBA. Amram leads Amram Jam A five hour afternoon marathon concert in Lowell Mass at the Rainbow. The event features performnces by local and visiting musicians, poets and actors. He will accompany the work of all of the different performers spontaniously, as he did with Kerouac a half a century ago. Amram has done this for for many years for the annual Festival's closing event. .
Amram returns for the third year to Okemah Oklahoma to perform in the annual tribute to Woody Guthrie, held in Okemah Oklahoma, Woody's place of birth. Amram will be accompanied by his son Adam Amram, and perform in a marathon of events, with Jimmy LaFave and scores of other Oklahoma musicians, song writers and poets. All events are free. Amram will also speak to members of the audience about his new orchestral work Symphonic Variations on a Song by Woody Guthrie, commisioned by the Guthrie Foundation at the suggestion of Woody's daughter Nora Guthrie. July 15-26 • - • Final work composing and orchestrating the last Variation of "Symphonic Variations on a Song by Woody Guthrie", to be premiered Sept 29 in San Jose California. Amram headlines an evening concert for U.S. Congressman John Hall, to be held in Kent Cliffs New York. Amram and his quartet perform at the free 4-H Fair Sunday afternoon the 29th at Veteran's Park in Carmel NY. Amram also mans the vegetable stand where he roasts corn for three days, when not performing with others. Musicians who worked with the songwriter Steve Goodman perform a tribute to him at New York's Bitter End to celebrate his life and the new biogrophy writen by Clay Eals. Goodman and Amram performed there together in the 70's. The Bitter End is located on Bleeker St and Thompson in Greenwich Village. Aug. 13 • 10 pm- midnight • New York's "Diamonds in the Sidewalks" The Artistry of the Sociological Imagination An evening with words and music. The concert was created to honor the American Sociological Association's annual conference. It is presented by Paradigm Publishers and The Theater of the New City. located at 155 First Ave. NYC. Amram hosts a tour for Danish National television of remaining venues where he, Kerouac and scores of musicians, painters, poets, authors, and people from all walks of life communed.and describe what is happening with today's new innovators as a result. The documentary film will be shown later in the year. August 19 • -2 pm • Interview for "Film Score Monthly Magazine"
august 23 • 2-4 p.m. • Interview for WOR AM about "On the Road" and Amram's new book "Upbeat: Nine Lives of a Musical Cat"
Amram talks about the meaning of Kerouac's classic book today for young people, their collaborations of fifty years ago,and Amram's continuing music making, travels and adventures, all described in his new book, due to be released in October. Pete Seeger and Amram perform together for a documentary film about Native American singer Roland Mousaa, filmed in Beacon New York. will play classics of Jazz, world music and Amram's own compositions. Corky Siegel and Amram reunite at the towne Crier on Route 22 in Pawling NY for the first time since Amram conducted the world Prmeiere of a symphonic work by Siegel with the Grant Park Symphony in Chicago. In the 1970's Amram and Seigel also performed and recorded together in Chicago with singer-songwriter Steve Goodman. Surprise guest poet Jose Pacheco joins Amram and his quartet with Kevin Twigg, drums and glockenspiel, John Dewitt,bass and Adam Amram congas. Actor John Ventimiglia of The Sopranos and other guests will also perform. September 6 • -10-12 p.m. • "Diamonds in the Sidewalks" A celebration of the 50th anniversary of the Kerouac/Amram first Jazz/poetry readings ever given in New York in 1957. The program will be held at the Bowery Poetry Club on Third Avenue and Bleeker Street. It will be filmed for BBC and broadcast internationally at a later date. Kerouac's favorite classics of jazz and world music which he heard while growing up in Lowell. Actor John Ventimiglia of The Sopranos will read excerpts from On the Road with musical accompaniment. For the last days of the three month appearance of the originsl Scroll for Kerouac's On the Road in Lowell, Amram's quartet joins Orchestra New England conducted by Kay George Roberts at the Merrimack Theater in Lowell Mass. the concert is from 4 to 6 pm. Amram catches plane from Boston to New York directly after Lowell afternoon concert in time to play finale for Farm Aid concert for the 15th time with Willie Nelson. It is being held this year at Randall's Island. See Farm Aid webpage for details. David and Adam Amram perform a concert and seminar showung the influence of Jazz over the past one hundred years, and how it relects as wella as effects much of what our culture is about. The event takes place at Rivier College and is open to the public. Amram and his quartet perform music inspired by his lifetime of travels, as well as his chamber music played by violist Midhat Serbagi and pianist Heidi Upton. the concert will be held at the Stella Adler Studio 31 West 27th Street. Amram composed music for Arthur Miller's Incident at Vichy which Harold Clurman directed in 1965 at the Lincoln Center Theater. September 16-18 • Day and night - • London Celebrates the 50th Anniversary of the publication of "On the Road"
Amram has been invited as a special guest to appear in London at the British Library to perform in a series of events. He will accompany readers and appear on panels throughout the day. In the evening, he will host a screening of the classic beat documentary silent film Pull My Daisy, narrated by Kerouac for which Amram composed the score, co-wrote the title song with lyrics by Kerouac, Allen Ginsberg and Neal Cassady and in which Amram appeared as Mezz McGillicuddy, the deranged french hornist. Amram will also give a special concert with London musicians, performing classics of jazz, world music and recreating his jazz/poetry collaborations with Kerouac. September 29-30 • 8 p.m. • WORLD PREMIERE OF "SYMPHONIC VARIATIONS ON A SONG BY WOOODY GUTHRIE"
Conductor Paul Polivnick conducts the premiere performances of Amram's new orchestral work,to be performed by the Symphony Silicon Valley. The work was commissioned by the Guthrie Foundation and uses the song This Land is Your Land as a basic theme. Each variation takes the listener on a voyage through American music, using the idioms of Native America, the South, Oklahoma church music, Mexican American cantos , blues,and jazz. The finale incorporates the sounds of Middle Eastern, Asian, Afro-Cuban traditional Jewish and other polycultural sounds of New York of the 40's, music which Guthrie heard constantly when living in Brooklyn. Amram performs, reads and hosts programs throughout the three days and nights of the annual festival in Kerouac's home town of Lowell, with the final five hour Sunday afternoon Amram Jam where all attending the event read a poem or play music, accompanied by Amram and his quartet. his New York quartet with Kevin Twigg,drums, John deWitt, Bass and Adam Amram, congas. At Woodland Community Temple, 50 Worthington Road, White Plains new York. Actor John Ventimiglia of The Sopranos reads from the original typewritten 1951 Scroll which was Kerouac's first unedited draft of what six years later became his pulished novel. Musical accompaniament as well as pieces representing the era will be performed by David Amram and members of his Denver based trio Tony Black on drums and Artie Moore on bass. Professor Joshua Kupetz, one of the editors of the Scroll, just published by Viking Press, will also speak about the Scroll and its significance a half a century later. The event will be held at the Denver Public Library, and admission is free. Amram discusses how Kerouac's writings. ideas and friendship influenced Amram's symphonic work, including his two newest orchestral pieces, Symphonic Variations on a Song by Woody Guthrie and Giants of the Night a flute concerto commissioned and premiered by Sir James Galway. At 7:30 pm, Amram will read passages from his newest book at Tattered Covered LoDo, the downtown branch of Denver's largest independent book store at 1628 16th Street. There will also be a few brief musical performances by him, as well as disucussion with the audience. All ages are invited to this free event. Amram and his trio with Tony Blsck on drums and Artie Moore bass play a fund raiser for Denver's prize winning independent radio station. Amram joins Professor Joshua Kupetz, one of the editors of the original Scroll for Jack Kerouac's On the Road and addresses Kupetz's English literature students, demonstrating the relationship of literature and music in different societies, showing how both authors and composers have used their own cultures to enrich their creations, while also serving as documentarians for their time, as well as often collaborating and being inspired by one another. Amram appears at a series of concerts, seminars and readings arranged by Prof David Irwin of Eckart College. Amram will host a screening of the 1959 documentary film Pull My Daisy in which Amram appeared as well as composing the music to accompany Kerouac's narration. He will also host and perform classics of jazz and world music, and accompany readings from the work of some of the authors and poets he has collaborated with over the past fifty years. From 10 a.m. until noon, October 27, Amram will attend the event and be a featured author, reading from and signing his new book, Upbeat: Nine Lives of a Musical Cat. He will also co-host a panel celebrating the 50th anniversary of the publication of Kerouac's On the Road , and discuss his twelve years as the author's musical collaborator as well as contributing to the founding of the Jack Kerouac Writer's Residence in Orlando Florida. October 31 • 7-9 p.m. • AMRAM READS FROM HIS NEW BOOK AT THE HARVARD COOP IN CAMBRIDGE MASS. Amram will return as the featured author to Harvard Square, reading from and signing his new book, Upbeat: Nine Lives of a Musical Cat.for a Holloween Eve special presentation. Amram spends the day in Boston at the Berklee School, with students, sharing with them the experiences he has had as a classical composer, jazz artist and collaborater in the theater, ballet, films as well as a being a pioneer of jazz poetry 50 years ago with author Jack Kerouac. Amram will give a concert in the evening, before driving back to New York to fly to San Francisco. Francisco: A thIrty year reunion with Floyd Red Crow Westerman, Dennis Banks, Kris Kristofferson and Taj Mahal. Amram performed in the 70s throughout the country with Floyd Red Crow Westerman and Dennis Banks for The Longest Walk, which is being repeated this coming winter in a walk across the country by Native Americans and supporters to seek better social conditions for all Americans. Surprise guests join Amram and his quartet with Kevin Twigg, drums and glockenspiel, John Dewitt,bass and Adam Amram congas. Actor John Ventimiglia of The Sopranos will also perform. Guest at the opening ceremonies and viewing of the new exhibition at the New York Public library 5th Ave and 42nd Street. The original Scroll for On the Road is being installed at the Library. Amram has played over the past three years in various parts of the ciuntry where the Scroll has appeared and will continue to do so when it resumes its tours to various libraries. BBC, perform music, do panels, host a screening of the 1959 documentary film Pull My Daisy in which Amram appeared as well as composing the music to accompany Kerouac's narration. He will also host and perform classics of jazz and world music, and accompany readings from the work of some of the authors and poets he has collaborated with over the past fifty years, and many of today's young writers and musicians. Author Carolyn Cassady and poet Ron Whitehead will join artists from around the world for this event, organied by Welsh poet and playwrite Richard Deakin. Amram joins authors Ashley Kahn and John Leland in readings and discussions with the audience about the enduring legacy of jazz as an influence for all aspects of our society. This free event is held in one of Manahttan's premier independent bookstores The Housing Works Books, located at 126 Crosby Street in Soho. Nov 17 • 3 pm • LINCOLN CENTER LIBRARY PRESENTS "AN AFTERNOON WITH DAVID AMRAM" CELEBRATING HIS 77TH BIRTHDAY AND 50TH YEAR OF NY SHAKESPEARE FESTIVAL'S FIRST SEASON IN CENTRAL PARK, WITH AMRAM AS THEIR FIRST COMPOSER IN 1957. David Amram is joined by a group of performers including Metropolitan Opera violist Midhat Serbagi, pianist Heidi Upton,opera singers Anne McCenna and David Kellet to perform excerpts from Amram's opera Twelfth Night with a libretto by Joe Papp, the founder of the New York Shakespeare Festival. Other guest artists will include actor John Ventmiglia, Amram's own three children Alan, Adira and Adam. Original cast members from the Central Park's first summer season 50 years ago will also attend, and Amram will discuss his involvement with setting Shakespeare's words to music and how this influenced his other compositions. Actor John Ventimiglia of The Sopranos poets Frank Messina and Mike Figliola and surprise guests join Amram and his quartet with Kevin Twigg, drums and glockenspiel, John Dewitt,bass and Adam Amram congas. Between selected engagement TBA, Amram will complete the year 2007, composing his newly commissioned Concerto for Piano and Orchestra, to be premiered January 2009.he will also be completing revisions for the paperback re-issue by Paradaigm Press of his 2002 memoir Offbeat: Collaborating with Kerouac due to be re-released in March of 2008. Engagements for 2008 will be posted towards the end of this year.